We’d like to use this post as an opportunity to collect the third-party Fate publishers out there. Everyone knows Evil Hat as the primary source — but they’re far from the only one. So if you publish for Fate, let us know, here! Only one comment per publisher. Identify where to find you on the web, and where on the web to learn more about your Fate specific stuff. If you publish physical Fate products, let us know if you’re in distribution, and with which distributors. If you’re on DriveThru, give us a link to your publisher page (or subcategory page where you’ve collected all your Fate stuff). Comments may identify some or all of the Fate products you’ve published, but if the list is extensive, please don’t list them all. Stick to your best known or most recent ones, and let the links you provide (as described above) do the rest of the work. Comments that don’t follow these guidelines will be removed. The Fate More Kickstarter wraps up this Wednesday, but it’s already due to make a mark on the state of open content for Fate. Thanks to some “Extra” goals tucked in between the main stretches for the campaign, sometime this year we’re going to see the debut of open content from the Atomic Robo RPG and — in less than $1000 more at the time of this writing — open source superpower rules from Venture City. But there’s even more potential open content past that point, at each of the $5000 milestones between the major stretches of the campaign. If you’re a fan of the open Fate content we provide on this site, and aren’t yet a backer of Fate More, please consider backing and helping us move towards a bigger, opener future full of Fate content! 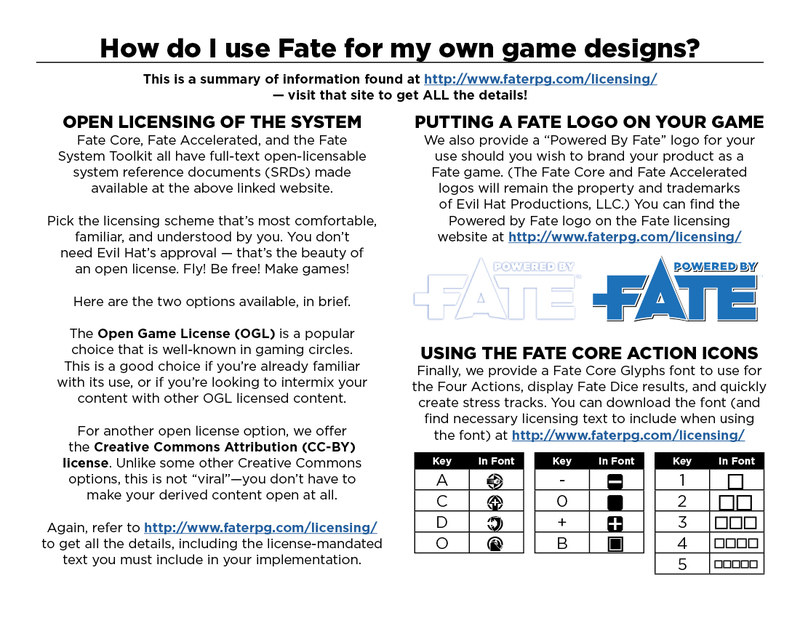 As always, you can explore the existing open licensable Fate here, at http://www.faterpg.com/licensing — and get a clean, beautiful presentation of that content at Randy Oest’s Fate SRD site. 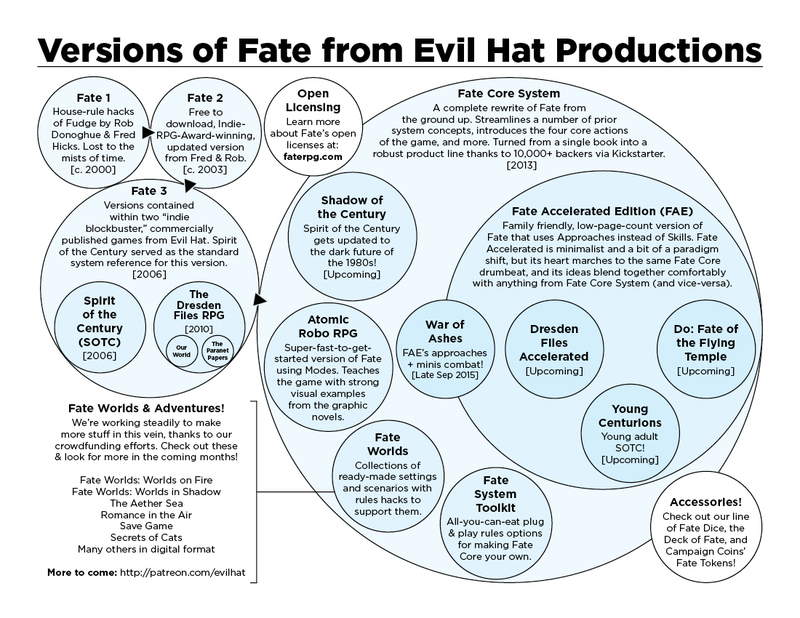 Newly updated (though parts of it have been there a while) on evilhat.com — you can find it at http://www.evilhat.com/home/spheres-of-fate/ (and learn more in-depth licensing information for Fate here on faterpg.com). There’s been some confusion around boosts. Lenny and Ryan have cleared it up. 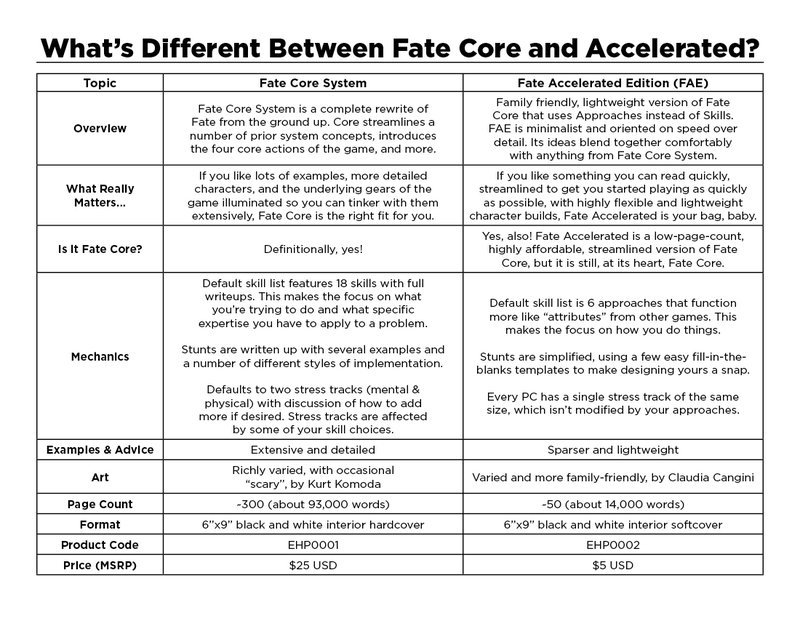 I’ve been seeing some discussion, off and on, about Fate Core System and Fate Accelerated Edition. I’ll call them Core and FAE in this post, because it’s Sunday and I am lazy. I figured I’d chime in on the discussion, because I’m discovering that I have some opinions about it. Also, this is just one guy’s opinion. There are a lot of people out there better equipped than I am to do this kind of analysis. I don’t really think of FAE as a separate entity from Core. It’s a build of Core, as Fred Hicks says, and I agree with him. FAE is what happens when you open the big Core toolbox and pull together the socket wrench set, the allen keys, and the WD-40, and toss in an old voltmeter you found in the back closet. It even still has both lead cables, so we’re in business. But FAE does behave a bit differently than Core as expressed in the game’s example settings. Why is that? Yes, stunt templates and single stress track, but really it comes down to the difference between FAE’s approaches and Core’s skills. This might seem like arbitrary jargon, but it’s not—it points to a very real difference in what they represent. The major difference is that skills describe what problems you can solve, while approaches describe how you solve problems. The standard approaches in FAE (Forceful, Quick, Careful, Clever, Sneaky, and Flashy) are things everyone can do. They don’t tell you anything all that unusual about your character in terms of your competence – your capabilities tend to be assumed based on genre and setting conventions. Characters in a Star Wars campaign can drive speeders and operate computers and shoot blasters. You don’t need an aspect to justify it, it’s just part of the setting. This means you need to make sure everyone is on the same page regarding these assumptions, especially if some players are less familiar with the setting. If you have a capability outside the norm for your setting, take an aspect to reflect it. You probably need a Force-related aspect to be a Jedi in a Star Wars game, for example, because not all the characters in Star Wars have access to using the Force. All this adds up to FAE having a tighter focus on aspects than Core tends to have. Another consequence of aspect + setting-driven competence in FAE is that gradations of competence aren’t important. If you’re a hacker, you’re a hacker; you won’t find out who the better hacker is by looking at the character sheet. Approaches, while they don’t say much about how good you are with a longbow or how much you know about the lore of faerie, pretty obviously tell you something about your character’s personality. Of course you’ll look for ways to use your character’s highly rated approaches—that Flashy +3 or Forceful +2, over your Sneaky +0. And that’s OK—real people do that, don’t they? They’re almost aspects in themselves—invokable and compellable with a fate point. Hm. That said, something I wish I’d stated more strongly in the FAE text is that sometimes the GM has to push a bit to make sure that the approach the player is choosing to use not only matches the fiction they describe, but is effective at all. Sometimes, circumstances demand that you be sneaky; nothing else will do. Which brings up the issue of short skill lists vs. approaches. Approaches aren’t just a short skill list—remember, approaches tell you how you do things, not what you can do. Short skill lists are a fascinating topic for another post , but for now, just keep in mind that not every Fate game with a short skill list is trying to be an implementation of FAE. If you specifically want to use approaches for your game, and you want a list that’s different than the FAE default list, make sure you stick with descriptions of manner—i.e., how you do things—not things like D&D stats (as in Fate Freeport Companion) or roles (such as D&D classes or Leverage Hitter-Hacker-Thief-etc. roles). While those may be distinct from skills as well, they’ll play differently than approaches. FAE approaches tell you how, Core skills tell you what. FAE requires a firm shared understanding of genre assumptions. FAE emphasizes aspects to a larger degree than Core. FAE doesn’t model fine degrees of difference in competence. Approaches can reveal aspects of personality. All approaches are useable by everyone, which feels different than the Core skill list. Right around the time Spirit of the Century was published — maybe a little later, but if so not by much — Evil Hat stopped writing Fate as FATE. In essence, as Fate 3.0 came about (starting with Spirit of the Century), the old acronym the system had started with (first “Fudge Adventures in Tabletop Entertainment” and then “Fantastic Adventures in Tabletop Entertainment”), carrying up through Fate 2.x, stopped being a part of the name. Old habits die hard, though. For the past 7 years many folks have continued to insist on writing Fate as FATE. It’s not “correct”, but it doesn’t really matter that that’s so. If folks want to write it that way for their own purposes, knock yourselves out. But if you want to portray it in a way that’s consistent with the official name as conveyed by Evil Hat: it’s Fate. The licensing options for Fate—AND the system reference documents for Fate Core and Fate Accelerated—are live! We’re offering the text of Fate Core and Fate Accelerated under two different open licensing schemes: the tried-and-true Open Game License (OGL), and a Creative Commons Attribution Unported license (CC-BY). This was made possible by the generous funding of backers through the Fate Core kickstarter campaign, and our efforts in developing Fate Core as a written-from-the-ground-up, entirely-our-own-text version of Fate. Visit the licensing page to get started. There, you’ll find a quick overview of each license, our new Powered by Fate logo for use by third party publishers, and the Fate Core Glyphs font for those of you who want to use the “four actions” icons developed for Fate Core. Drill down into the individual licensing pages for specific details on how to make use of each license. You’ll also find the license-specific system reference documents on those drill-down pages. We’re pleased as ever to continue our commitment to keeping Fate’s text free for use by third party publishers for both personal and commercial use, and we can’t wait to see what folks have in store for this new era of the Fate system. Bring it on, folks—and thank you! This post was triggered by a conversation in the Fate Core community on Google+, started by Ian O’Rourke. I’ve heard a few folks expressing concerns that players in a Fate Accelerated (FAE) game are constantly going after their +2/+3 approaches to the exclusion of the others. Essentially: Players are creative, and they’re great at rationalizing one of their higher-ranked approaches in avoidance of the others — what am I to do? First off, I’ll say quickly that I don’t consider that to be an actual problem. If fun is had, and players get the satisfaction of solving the puzzle of how to apply their characters’ best abilities, I’m not sure there’s all that much trouble in paradise. The only zone of consideration where this becomes an actual problem, for me, is if that starts to feel like something that’s boring. Gameplay should reliably produce fun: if fun is getting sapped out, something does need to be done. Short of that? All is functioning as intended. We see plenty of times in fiction where our heroes figure out a way to tackle the problem that’s surprising and unusual and just so happens to apply their abilities at their most effective. And Fate, after all, is a fiction simulator. So: that. But that doesn’t mean there aren’t tools in the toolbox to apply when the it feels like characters are taking a less optimal approach (ha) by twisting things to focus on using that high rank. FAE itself talks about using approach-based difficulties for some tasks. Simply put, this is the GM setting the difficulty slider at different levels depending on the approach used to get the job done. Picking a lock might be a Careful activity right front and center, of only Fair difficulty. You want to pick that lock Forcefully (also known as kicking the door down)? That’s more like a Great. Makes sense, and follows fiction we already know. That example happens to point out something David Goodwin said over on Google+ — the approach the player selects colors how the action is performed. You may want to do something quietly using anything other than Sneaky, but you’re most likely going to make noise using that other approach. So if a player is choosing an approach other than what you’d expect as the “solution” for the problem at hand, take the time to talk this out: how does using that other atypical approach change the nature of the solution? Rolling a boulder to block a mountain pass might be a Forceful action when you put your back into it, but if you’re going for Clever instead, you probably needed to find the right lever and fulcrum first. And that reveals another tool for this particular toolbox, something I offered over on the Google+ thread: approach-based costs. Instead of changing the difficulty — that’s not always an option — consider the price of using the somewhat less applicable approach. Going back to our locked door, if you’re Careful or Sneaky about it, you can probably get past that lock without anyone realizing you’ve done so. A Forceful or Flashy approach, on the other hand, probably means the door can’t be locked again. Your passage will be marked. Similarly, you might keep an ally on your side if you’re Clever or Sneaky about getting information from them, but if you go for Quick or Forceful, you’re likely being rude or outright scary in your pursuit of the truth. Bridges will be burned. Finally, if you’re simply looking to encourage a player to take the least optimal path once in a while, maybe it’s time to bust out an approach-triggered compel, assuming you have an applicable aspect at hand. “You have In Love With The Prince and you’re trying to gain the King’s aid, so it makes sense that you’d decide to impress him by doing something Flashy (your +0 approach).” This is tricky territory, though; that phrasing in quotes is supposed to continue with a “This goes wrong when…” chaser, and rolling that very suboptimal approach has to count as something that “goes wrong”. Use such techniques lightly and sparingly, as typically a compel is a flag that it’s time to set aside the dice. And you could — and perhaps should — do that here, in fact: assume failure, and have fun with the results. Even though that other approach hasn’t been rolled, it has been highlighted, and that’s part of the goal. How do you handle “one note approach” behaviors in FAE games at your table?